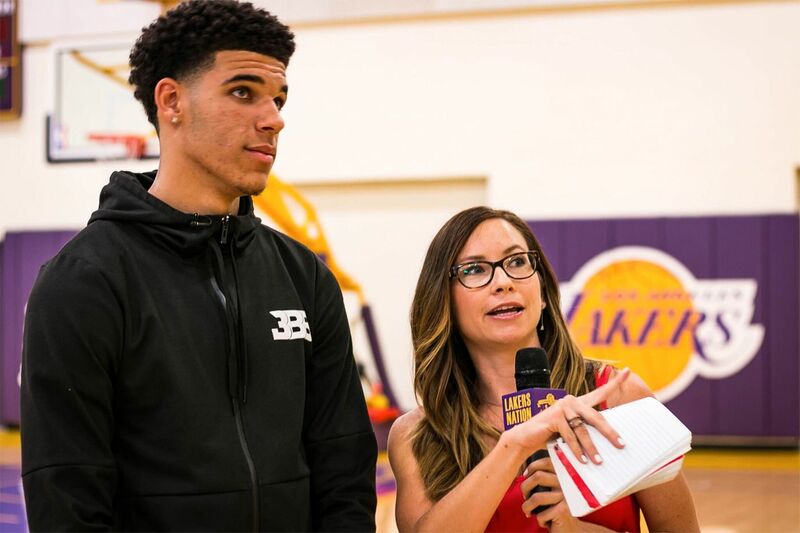 Serena Winters, see here with Lakers point-guard Lonzo Ball, has joined NBC Sports Philadelphia as the network’s new Sixers sideline reporter. Following the controversial decision to remove Molly Sullivan from its Sixers broadcasts after her five seasons covering the team, NBC Sports Philadelphia announced on Thursday it had hired Serena Winters as its new sideline reporter. Winters comes to Philadelphia from NBC Sports Northwest and previously hosted the daily prime time sports show The Bridge. Prior to that, Winters was the lead reporter for Lakers Nation and part of the on-air talent team at Spectrum SportsNet. "I visited the Philadelphia 76ers headquarters. I met with Brett Brown, and I stood out on the second floor overlooking the practice gym. It was then that I got that gut feeling that you always hope for when making a big decision," Winters wrote. "That gut feeling said this is where I'm supposed to be, working for all of you, the fans, and bringing you the very best coverage of your favorite basketball team, in the best damn sports city in the world." In addition to joining Marc Zumoff and Alaa Abdelnaby on all Sixers telecasts, Winters will cover the team as a multi-platform reporter, where it appears she'll also assume some of the responsibilities once held by former Sixers insider Jessica Camerato, who was also let go last July. Sullivan has since landed with the Eagles. NBC Sports Philadelphia and NBC Sports Philadelphia+ will air 70 Sixers games this season. Last season, the network posted its highest Sixers ratings since the 2011-12 season, which were up 45 percent over the 2016-17 season. The Sixers aren't the only telecast that NBC Sports Philadelphia has made changes to this off season. Over the weekend, the network confirmed that Chris Therien, a former Flyers defenseman affectionately known as "Bundy," won't return as the rinkside analyst for Flyers games this season. It remains unclear if the network will fill the role with another analyst, though it would be unusual to have an NHL broadcast without an inside-the-glass reporter. Play-by-play announcer Jim Jackson and alternating color analysts Bill Clement and Keith Jones will return to call Flyers games this season. "I will not be back between the benches this year. That was a decision I found out about last week," Therien announced in a video posted to Facebook and Instagram that has since been deleted. "I'm disappointed about the upcoming season not going the way I thought it was going to go."